I feel like the run up to Christmas has already taken its toll on me, and it's only the first week of December! I left work at 4pm today, got home and flaked on the sofa. Next thing I know I wake up 30 minutes later after having a quick snooze. That is unheard of for me and in my household. I wonder what my five and two year old got up to so quietly during that time! I've found no evidence yet, but it's a worry! Here are my nails for week two of the Nail Polish Canad Holiday Nail Art Challenge. This weeks theme is decorations and I did some green garland with multicoloured baubles hanging from it. The base colour is Picture Polish Beige. The stems of the garland are Ulta3 Chocolate Cake. I used a mix of greens for the garland including Picture Polish Kryptonite, Zoya Logan and a few Ulta3 greens. The baubles are rhinestones and I paired each one up with a matching metallic bow. Colours used for those are Pretty Serious Santas Sunburn, Essie Blue Rhapsody, Essie No place like chrome, Essie Good as gold and Kleancolor metallic aqua. Once again, if you want to see some great nail art you should check out the other entries. You can also vote for your favourite. If your favourite happens to be mine, then thanks for the vote! 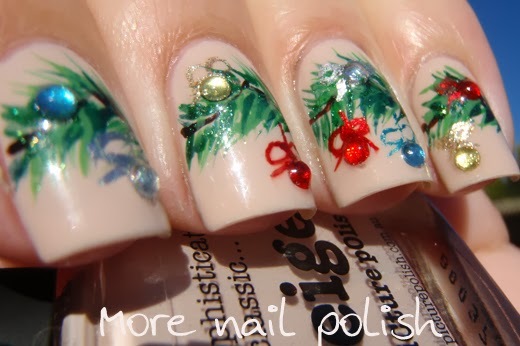 Best 2013 Christmas nails I've seen so far! Love them! this is so good work,very nice ♥! Very pretty with just the right amount of sparkle too! 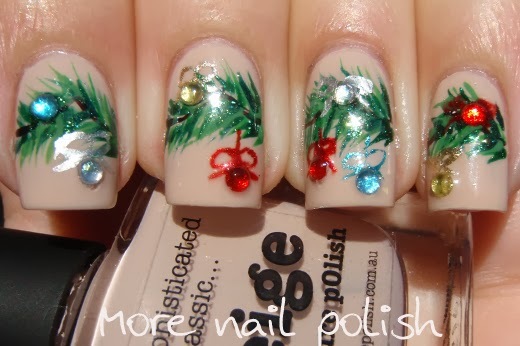 This might be my favorite Christmas mani ever! Simply wonderful! 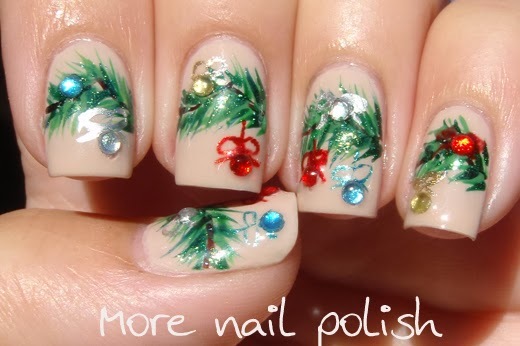 That's a really fun and festive mani. I love it! So impressive! 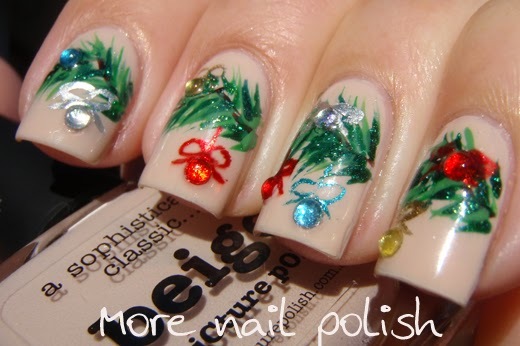 It's a nice choice for the holidays but still different than all the other manis I'm seeing. Omg, I love that! So pretty!